Home > Food Advice > Cured vs. Uncured Ham: Which Is Better? Ham is made from the hind leg of a hog. Fresh, uncured ham is an unpreserved leg of pork, whereas cured ham is processed ham that is preserved through wet or dry curing that may include smoking. The curing process may also include adding a combination of sugar, salt, and other flavors. The color of cured ham will be pink or deep rose. Prosciutto and country hams are dry cured; therefore, their color ranges from pink to mahogany. Fresh hams, on the other hand, will be pale pink or beige—the color of a fresh pork roast. In this article, we will continue to explain the characteristics of cured vs. uncured ham. We will also discuss how to cook uncured ham and cured ham, and which ham is better, as well as how to store each ham. What is the difference between cured vs. uncured ham? To answer that, let’s first address the question, “What does cured ham mean, exactly?” Cured ham is made by adding artificial nitrates or nitrites like sodium nitrite or potassium nitrite, sugar, phosphates, and other seasonings and preservatives to a regular mixture of salt and brine. Nitrites are important for curing because they help prevent bacterial growth on meat. If not properly preserved, the ham would decompose rapidly. Most meat cannot be kept at room temperature without spoiling, and consumption of spoiled meat can cause food poisoning, like botulism due to Clostridium botulinum. Cured meat therefore has a significant shelf-life. You can make cured ham yourself. For a home-cured ham, you will either smoke it or pack it with salt, sugar, and other flavors. Dry curing is another process used to make prosciutto and country ham. This is where fresh ham is rubbed with a dry mixture of salt and other ingredients. As a result, a dry-cured ham will taste quite salty. When it comes to cured vs. uncured ham, which is better? This question often comes down to the nitrites added to cured ham. Again, the nitrites are added as a preservative to prevent and/or delay bacterial growth, which can cause botulism. However, nitrites in ham and other meats are also associated with a higher risk of cancer. This is because in the stomach, nitrites convert to nitrosamines, which are considered deadly carcinogens. A meta-analysis published in the British Journal of Cancer in 2012 found that 50 grams daily of processed meat, such as ham, consumption was statistically linked with a 19% increased risk of pancreatic cancer. The nitrites in uncured ham are a little better. Nitrites occur naturally in many foods like vegetables. 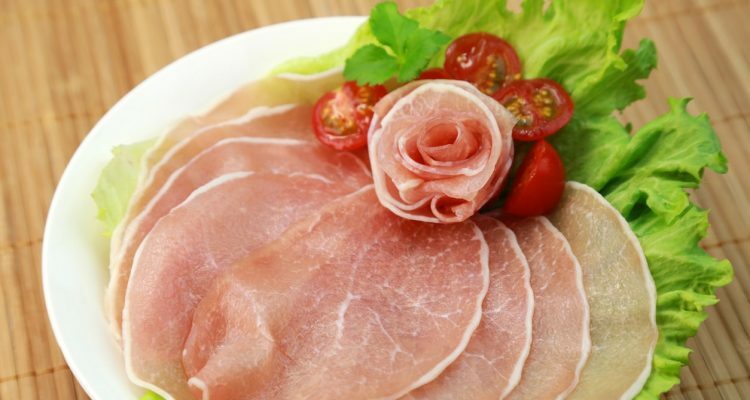 In uncured ham, it is cured with the celery mixture that also contains sea salt and parsley and beet extracts. Uncured ham doesn’t put you at risk of cancer because the vegetable mixture is also high in vitamin C, which prevents the conversion of nitrites to nitrosamines. As a result, uncured ham is considered a lot safer for you than cured ham. How do you store your ham? In this section, we will examine storing cured vs. uncured ham. Uncooked, a cured ham will last five to seven days in the refrigerator, or you can follow the “use-by” date provided on the package. It will also last three to four months in the freezer. Cooked, a cured ham will last three to five days in the refrigerator or one to two months in the freezer. Vacuumed sealed and unopened cooked ham will also last two weeks in the refrigerator or one to two months in the freezer. What about dry-cured country hams? A cooked country ham will store a week in the refrigerator, whereas an uncooked country ham stores two to three months in the refrigerator. Both cooked and uncooked country hams store for a month in the freezer. Fresh, uncooked uncured ham stores in the refrigerator for three to five days, or you can also freeze it for six months. Fresh, cooked uncured ham will last three to four days in the refrigerator or three to four months in the freezer. Now, it’s time to cook your ham. In this section, we will look at how to cook a cured ham vs. an uncured ham. A cured and smoked ham will take less time to roast or bake in the oven than an uncured ham. You will bake covered in the oven at 275 to 300 degrees Fahrenheit until the thermometer reads 155 to 160 degrees Fahrenheit. You can also boil the cured ham until the thermometer reads 160 degrees Fahrenheit, which will be about 20 to 25 minutes per pound. Is uncured ham ready to eat? Not unless you cook it first. You will need to put forth a little more effort when it comes to cooking a fresh, raw uncured ham. This process will be similar to preparing a turkey. When you finish cooking, the internal temperature will be between 145 to 160 degrees Fahrenheit. The ham will be drier when cooked above 145 degrees Fahrenheit. Remove uncured ham from the refrigerator up to two hours before cooking. The ham will reach room temperature, and therefore cook evenly during cooking. Trim external fat down to a quarter inch with a straight edge knife. Score the remaining fat and run the knife through the remaining fat layer. Insert a meat thermometer in the middle of the ham. Transfer the ham to a shallow baking pan with a wire rack. There is no need to flavor the ham since smoked uncured ham has its own unique flavor. Preheat the oven to 325 to 350 degrees Fahrenheit, and place the ham in the oven. Roast the ham until thermometer reads 150 to 155 degrees Fahrenheit. In general, it will take 18 to 20 minutes per pound for a whole, bone-in ham or 30 minutes per pound for a whole, boneless ham. In the last hour of cooking, for an optional glaze, you can use honey or maple syrup. Remove the ham from the oven and transfer to a serving platter, and let the ham sit for 10 to 15 minutes before cutting and serving. The internal temperature will continue to rise at this time, and will reach the required temperature of 160 degrees Fahrenheit. Cover the ham with aluminum foil so it stays warm. Throughout this article, we learned the differences between cured ham and uncured ham, including how to cook and store them. That being said, when it comes to cured vs. uncured ham, which one should you get? Cured ham and uncured ham both contain nitrites; however, the vegetable-based nitrites in uncured ham are considered natural and present no known harm to your health. On the other hand, the nitrites in cured ham are thought to convert to carcinogens called nitrosamines. As a result, if ham is on your shopping list, I would suggest you put uncured ham in your cart rather than cured ham. Canadian Bacon vs. Ham: What Is the Difference Between the Two? Carey, E., “Cured vs. Uncured Bacon,” Healthline, May 1, 2015; https://www.healthline.com/health/cured-vs-uncured-bacon#2, last accessed July 11, 2018. “Ham and Food Safety,” United States Department of Agriculture Food Safety and Inspection Service; https://www.fsis.usda.gov/wps/wcm/connect/d1df4c79-ad2b-4dd4-a802-ed78cd14409d/Ham_and_Food_Safety.pdf?MOD=AJPERES, last accessed July 11, 2018. Builder, M., “What’s the Difference Between Cured and Uncured Bacon?” My Recipes; http://www.myrecipes.com/extracrispy/whats-the-difference-between-cured-and-uncured-bacon, last accessed July 11, 2018. Larsson, S.C., et al., “Red and processed meat consumption and risk of pancreatic cancer: meta-analysis or prospective studies,” BJC, Jan. 2012, 106: 603-607, doi: bjc2011585. “Storing a Whole Cured Zingerman’s Ham,” Zingermans; https://www.zingermans.com/Articles/Storing%20and%20slicing%20cured%20ham%202013_FINAL.pdf, last accessed July 11, 2018. “Can You Freeze Ham,” Dereeze; http://dereeze.com/food-and-cooking/can-you-freeze-ham/, last accessed July 11, 2018. Lohrey, J., “How to Cook Uncured Smoked Ham,” Livestrong, October 3, 2017; https://www.livestrong.com/article/439154-how-to-cook-uncured-smoked-ham/, last accessed July 11, 2018. Hickman, A., “How to Cook a Raw, Fresh Ham,” Cooking List, September 7, 2015; https://www.cookinglight.com/cooking-101/how-to-cook-a-raw-fresh-ham, last accessed July 11, 2018.